Leeds make the hour long trip up the A1M to the Riverside Stadium for a lunchtime kick off against fellow promotion hopefuls Middlesbrough. Having suffered defeat in four out of their last six league games, you'd imagine Bielsa may shake things up, especially when Brown has been passed fully fit; but according to Phil Hay not much will change with Casilla, Ayling, Jansson, Cooper, Alioski, Roofe, Harrison and Bamford all set to start, though having Bamford in the starting line up is a welcomed change. Let's be honest Ayling and Harrison are well off the pace, and I also feel Klich has been off poor in 2019 also. He grabbed himself a brace against Rotherham, he when watching the game back, he did little else all game! Phil Hay went on to say, due to injury doubts: Forshaw or Phillips, Hernandez or Clarke and Klich or Shackleton would start! Is it helping Leeds that Bielsa gives away the Leeds line up at least 24 hours before the game? If you could rest three players, who would they be? Is this a must win game? Roofe and Bamford starting is a massive change in intent...weakens the mid but adds punch up front obviously..352 maybe? Police will get tough with any football fans who cause trouble at this weekend's Boro v Leeds fixture, the force has warned. Last season, five Whites fans were arrested in connection with public order offences and throwing missiles after the two sides met in March. Flares were set off, while the police helicopter hovered overhead for the duration of the match and followed crowds into Middlesbrough town centre afterwards. Now, with the prospect of 4,450 Leeds fans descending on the town for the 1pm kick-off - the force has warned fans "intent on engaging in trouble" that they will be prosecuted and put before the courts. Match commander, Chief Superintendent John Lyons, said: "The overwhelming majority of football fans attending this match will simply wish to watch the game, support their team and enjoy the day, but sadly a small minority of fans attend matches to engage in antisocial behaviour and disorder, which can spoil the game for genuine fans and their families. "Any incidents such as missile throwing, pitch invasion or public order will not be tolerated. Officers will be in and around the Riverside Stadium alongside colleagues from British Transport Police, Middlesbrough FC and Mounted Section colleagues from Northumbria Police. "There will be dogs trained to search for pyrotechnics and drugs at all entrances to the stadium and anyone found to be in possession of either will not be permitted to enter and risk facing criminal proceedings." There will be added spice to this year's fixture, as both teams push for promotion. Leeds, currently joint top, were granted another 1,450 tickets by the Boro hierarchy last week which will guarantee a febrile atmosphere. And former Boro striker Patrick Bamford will make his first return to the Riverside since his big money move in the summer. The West Yorkshire contingent will be the Boro's biggest away attendance of the year, comfortably beating the 2,146 Sheffield Wednesday fans that made the trip to Teesside on Boxing Day. And there will be a number of policing tactics employed on Saturday to ensure the game goes off without trouble. Chief Superintendent Lyons continued: "Our primary aim on the day is to ensure the safety of everyone in and around the area and to facilitate a friendly and enjoyable day for all the genuine fans and their families who are attending." A dispersal order will be in place in the Middlesbrough town centre area, giving police additional powers to disperse any groups who may be causing a disturbance for a period of 24 hours. Leeds United fans who are travelling to Middlesbrough prior to or after the game are encouraged to gather at Spensley’s Emporium on Albert Road. I'm looking forward to seeing Roofe & Bamford up top, be nice to see two strikers in the box as oppose to Roofe on his own, our wing-backs will be happy having two goal poachers in the box to aim for ! Its the physical side that worries me. Say Gestede starts if Hugill and Britt are out, he may not be the most technical but he is a beast, 6ft4 and powerful, he would batter Cooper physically. Then there is Mikel, experienced player, another 6fter next to Besic another powerful international in midfield. Shotton and Flint and Ayala and Friend and Fry and Clayton. They may not be technical but there big big lads all bigger then anyone we have apart from Jansson. Just feel it could leave us a little lightweight in midfield, be tough for Roofe not to drift out of position a lot if we're playing him as a number 10..Also what did Roberts do wrong? True we could be lightweight in midfield, tbh Faaip I'm unsure what system Marcelo is gonna play if he is enforced to make changes. Location: Directly above the centre of the Earth. I'd be happy if we keep a clean sheet. "We can wait for the next game with serenity"
"I am quite clear in my mind that one has to feel sincere love for those he leads, and if he doesn't feel it naturally, then he must learn how to feel it"
Is there any way to watch this game online? I have heard it’s on the red button on sky??? Anyone know if that’s true? No it's definitely not on Sky red Button. Those that are travelling up there for the match, safe journey, hope to see some MOT members up there. 6.30am start for in the morning. Come on leeds !!! Same ref as the Forest game apparently. Fills you with confidence. Izzy Brown with the squad, as per a Patrick Bamford instagram and a Radrizzani tweet. Bielsa is clearly wavering from his 7-8 game rule if that's the case. Wonder whether that means that Pablo is likely to be missing? Anyway, if we play well we beat Boro. Everyone was scared of their height/physicality last time and we got a draw with Berardi at CB. 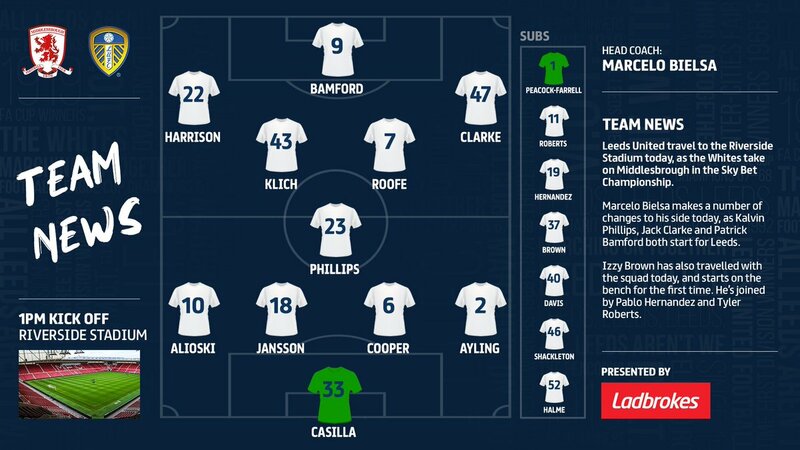 Bamford gives us a good option up front, though I'm with faaip in worrying that 10 doesn't get the best of Roofe. They'll rotate, I presume though.